Once a month I get together with a few friends to make quilts that we give away, not because we don't want the quilt but because there are so many reasons to make someone happy from the simple gift of a quilt. The quilts are given anonomously and we don't seek thanks, nor do we want recognition simply because the gift has really been ours in the planning, construction and especially in working together. It is a wonderful priviledge to be able to participate in this craft of making quilts, particularly doing so in the company of friends. Our rules are simple, we all have wonderful stashes of fabric, and speaking for myself I doubt I'll ever be able to use all that I've accumulated (and continue adding to) in my lifetime, so we use what we have and then because between us we also have quite a collection of inspiring books, we take turns to choose a design from one of our books - we try to find a book we haven't already used and that is what we work on each month. With a couple of us cutting, another stitching, someone pressing and most importantly putting the design together, we are amazed at what we get done in the day. So far the quilts have been simple designs, but who knows what we'll get to next! Bearing in mind what I've already said about anonimity, I'm going to share a couple with you, because I just love how they turned out! This past month we worked from Judy Martin's Log Cabin Quilt Book. 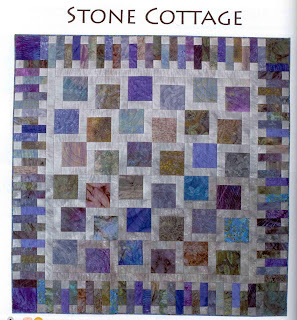 The pattern is called Stone Cottage and sadly we didn't have enough of the blue bali fabrics to make the wonderful border that is on the original, so we're going to leave it simply with a solid fabric. This photo really does no justice to the lovely fabrics we used. There's just so much detail in each fabric and it makes me feel quite relaxed, even refreshed just looking at it. Next quilt I've shared on the blog before, but here it is completed with quilting and binding. Quilting really adds a whole new dimension to the quilt, doesn't it. Sadly it's quite overcast and the colour isn't as good as it could be, but it is a lovely quilt and we will be proud to pass it on. That's all for now, I'm up to adding the binding on my growing up quilt.